Don't move in or out until it's been, So Clean Virginia Beach! 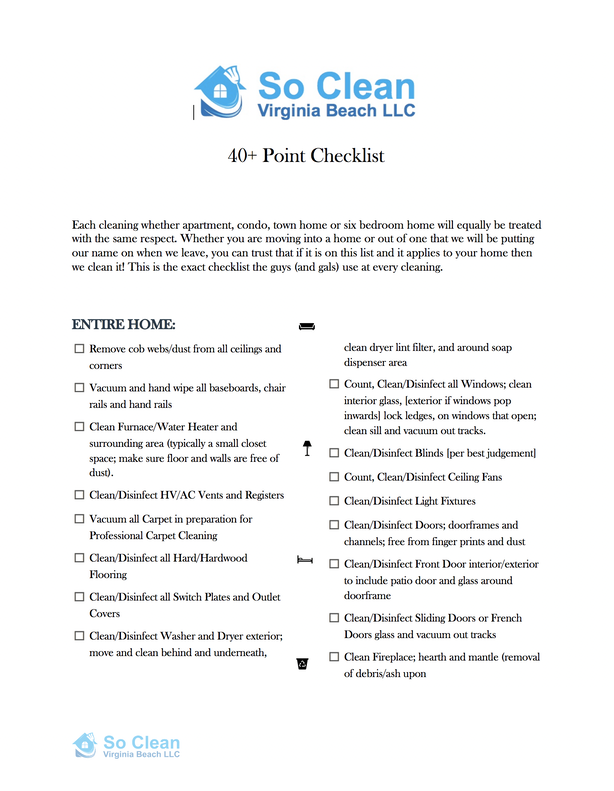 Wonder no more what a complete checklist entails when we come clean your home as it is all listed for you below! 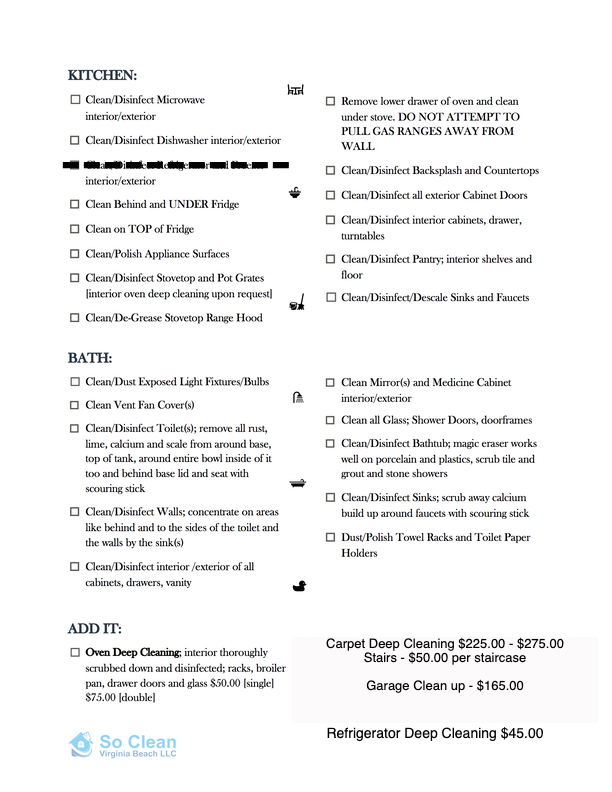 ​We use this same checklist at every apartment move out cleaning, house cleaning, condo, townhome, office building.. cleaning appointment. ​The fact is that there are typically dirty ceiling fans to baseboards no matter where we go. If there is anything you would like to mention because it is not on the list let us know to add it to your cleaning specifically. Often times we are asked if we can leave some of the things on this list OFF as they are already clean, however we still have to run through this checklist and physically touch each item in order for us to put our name on the bill, therefore you may point out these matters though rest assured they will be checked over no matter the condition regardless! Moving is not only out of a home it's into a new one also, and this move out house cleaning checklist is also used to move you into your new home as well. We pay attention to every minor detail to make sure whether you're moving out to be leaving a sparkling clean place for a new tenant to move into or that tenant's YOU! 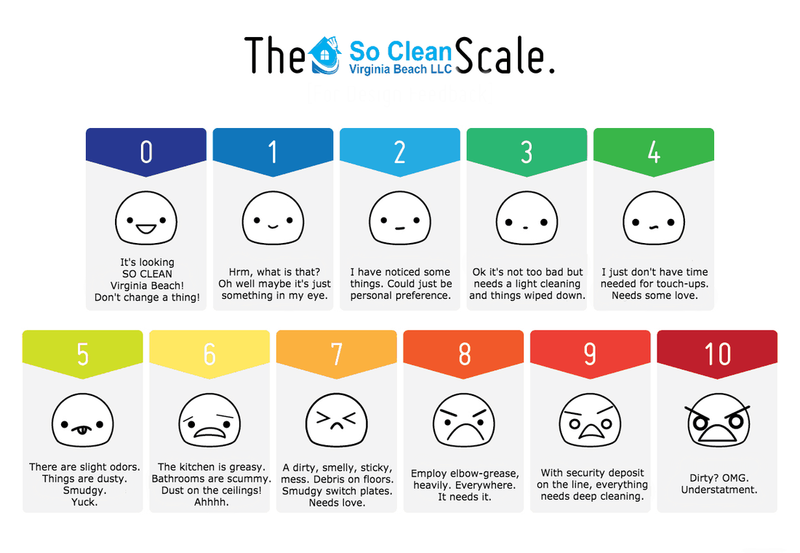 We use the chart below to gauge a typical home under 2,000 square feet using our 4 hour minimum to run through our 40 point cleaning checklist by conditions of the home on a scale of one to ten (1-10) one being the cleanest, ten being the dirtiest. The more square feet over 2,000 the more time is needed to complete the checklist and of course the dirtier conditions the longer it will take to do a thorough job. We will happily look up your address when you fill out a form on our website or call and go over a estimated time frame once all conditions are assessed. ARE YOU MOVING BUT STAYING IN THE VA BEACH AREA? MOVE IN AND OUT AND SAVE!!! If you are staying in the area and use us for BOTH move out AND move in cleaning service's you can enjoy 5% for each when booking with us, thats a total savings of 10%! Please also check out our referral rewards if you are looking to save even more on your cleaning bill.